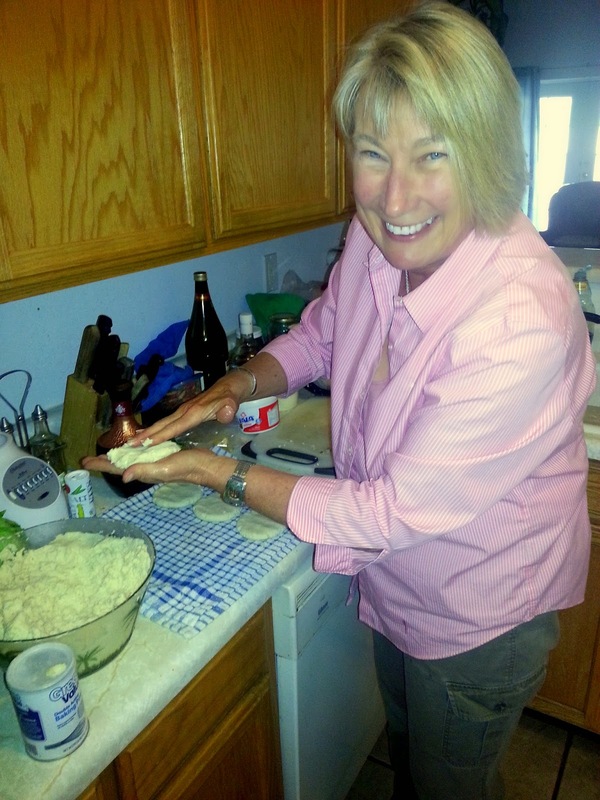 I was recently asked by my friend Bonnie to attend a cooking demonstration being put on at her neighbors house. Marena and her good friend Lupita treated us to a step by step demonstration of how to cook flat enchilada's, known as Sonarenses. 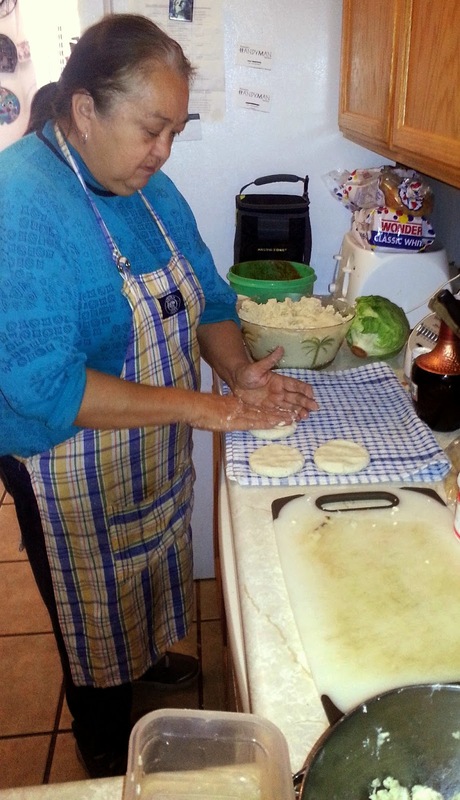 This is an old recipe form Lupita's mother and was some of the BEST Mexican food I have ever tasted. Lupita is originally from Guadalupe and Marena from a beautiful little town in Mexico, called Magdalena. They are naturals at explaining how to put together a fairly complicated dish. I think they would make an excellent team on the Food Network! I had never heard of this dish before. I have made enchiladas by rolling chicken, beef, or cheese, in a tortilla, covering with red or green chili, lots of Mexican queso and baking, but these were very different. 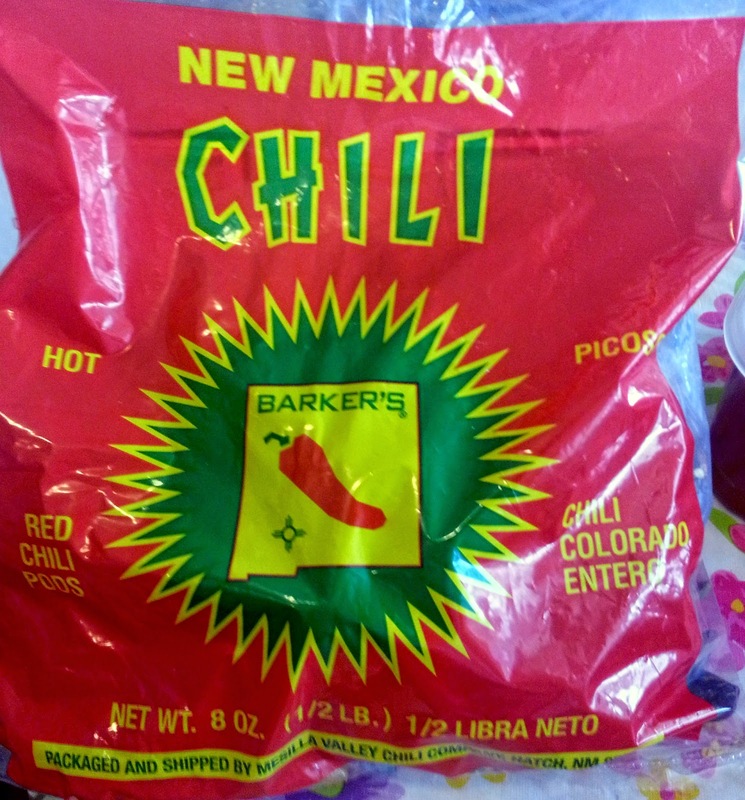 Use a whole bag of Barker's Hot Mexican Chili Colorado Entero (Red Chili Pods), which I found at Food City here in Nogales. If they are not in your local market, you can easily buy them online. Bring a pot of salted water to a boil. Add a little oregano (preferably Mexican oregano). Drop the pods in the boiling water. Cover. Cook for 5 minutes and then turn off heat. Set aside until the chilies are cool enough to handle. Strain the chilies, but reserve the cooking liquid. Remove stems and seeds. The skin of the chili will still be brittle. Blend the chilies in a blender with a little liquid from the chili pot. Add salt and 1 clove garlic for each blender of chilies. Add 2-3 Tbsp. chili powder. Lupita recommends La Reina de las Flores brand, but I could not find anywhere so used my standard chili powder from the Santa Cruz Chili and Spice Company (www.santacruzchili.com) in Tumacacori, Arizona. Pour the chili sauce through a fine mesh sieve to remove any seeds or stem pieces you may have missed making a smooth paste. 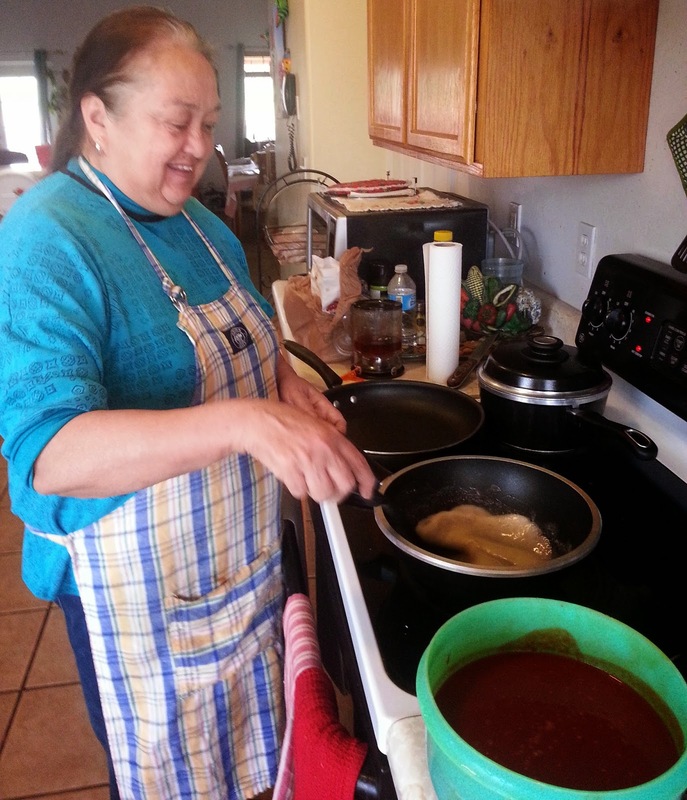 Here is Lupita making the flour/oil roux with blended chilies on her right ready to be mixed in. Heat 1/3 cup vegetable or corn oil in a saucepan or deep frying pan. Add 1/2 cup flour and stir to make a roux. Add garlic powder, oregano, salt as needed. When it starts to thicken, add the blended chilies. This chili sauce would be great on many different things, not just the flat enchilada's. And this is Marena stirring and adjusting flavors once the chilies have been blended with roux. Boil peeled potatoes until very soft. Set aside. Empty contents of Alejandro's masa (already prepared) into a large bowl. Masa is the Spanish word for dough, but in Mexico and other parts of South and Central America it is short for Masa de Maize and is a corn dough made from hominy. Add some of the boiled potatoes and mix gently with your hands. 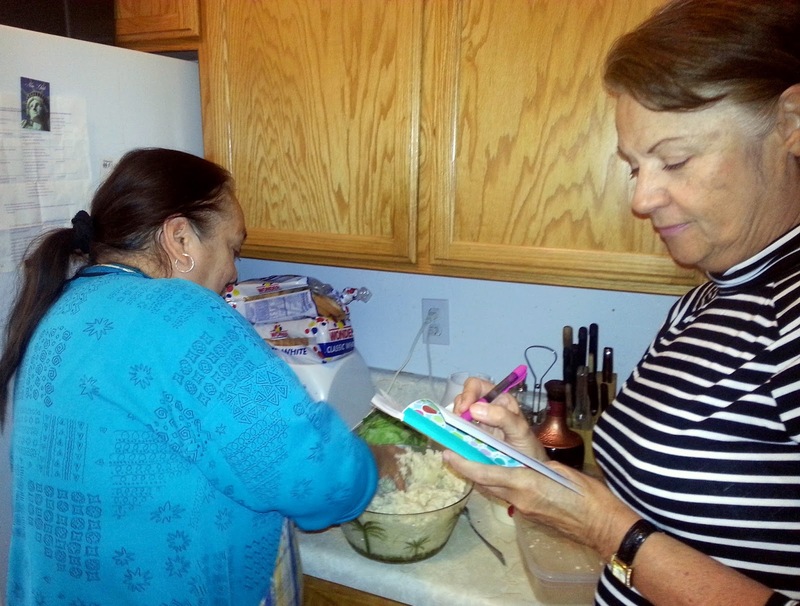 Neither Marena or Lupita measure ingredients, but Bonnie and I watched closely to attempt to capture the amounts they used. They have been making this dish since they were little girls; know it by heart and do not need to measure. Bonnie is carefully taking notes! Add about 1 1/2 cups shredded queso fresca (fresh Mexican cheese) or shredded Mexican 4-cheese blend. Add 2 Tbsp. baking powder and a little salt. 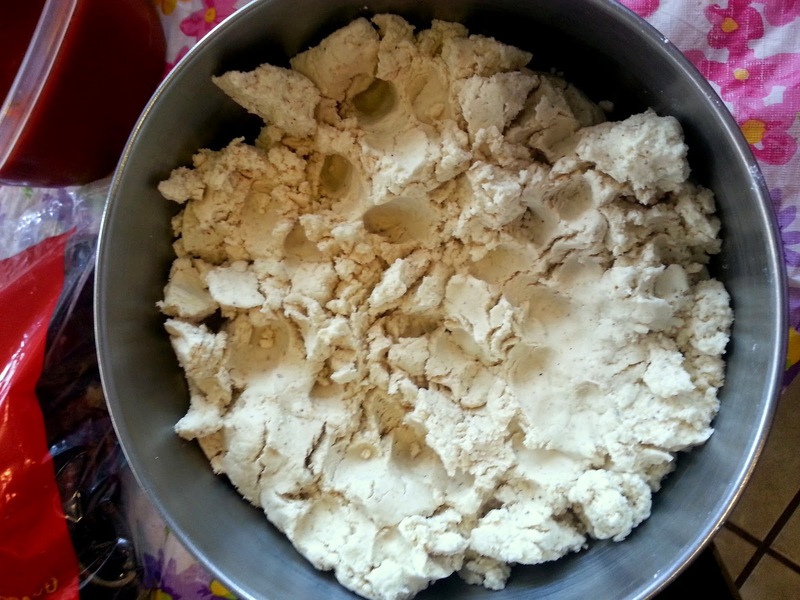 (Once mixed, masa can be frozen for future use.) Some recipes do not call for the baking powder, but that is what makes them rise giving these cakes their delicate texture. 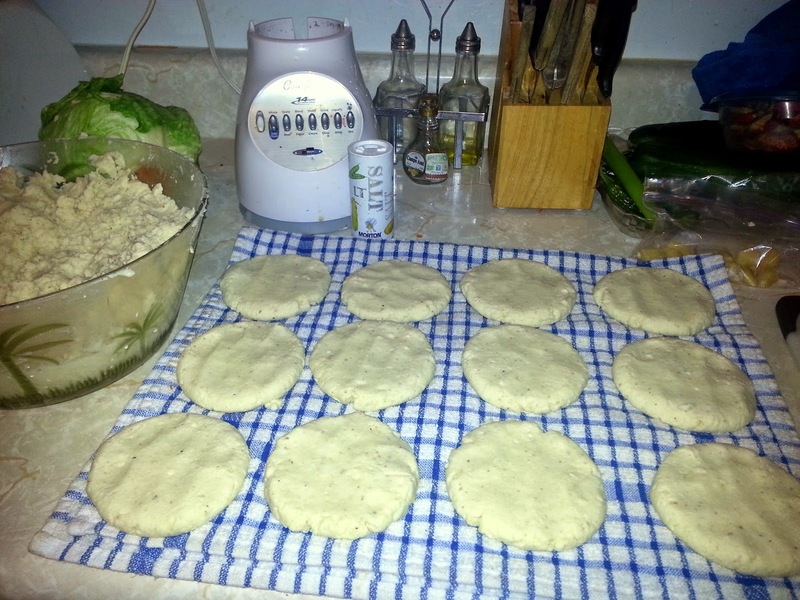 Form patties by rolling a ball of dough in your hands and then flattening with your fingers on a dishtowel. Patties should be about 3" in diameter, but you can also make mini enchiladas for hors d'oeuvres or larger ones for entre portion size. 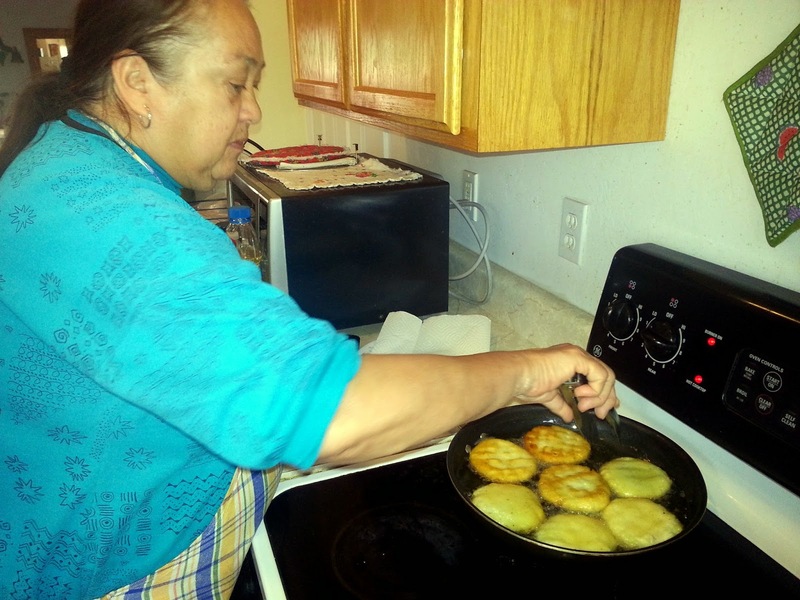 Yours truly trying my hand at forming patties. 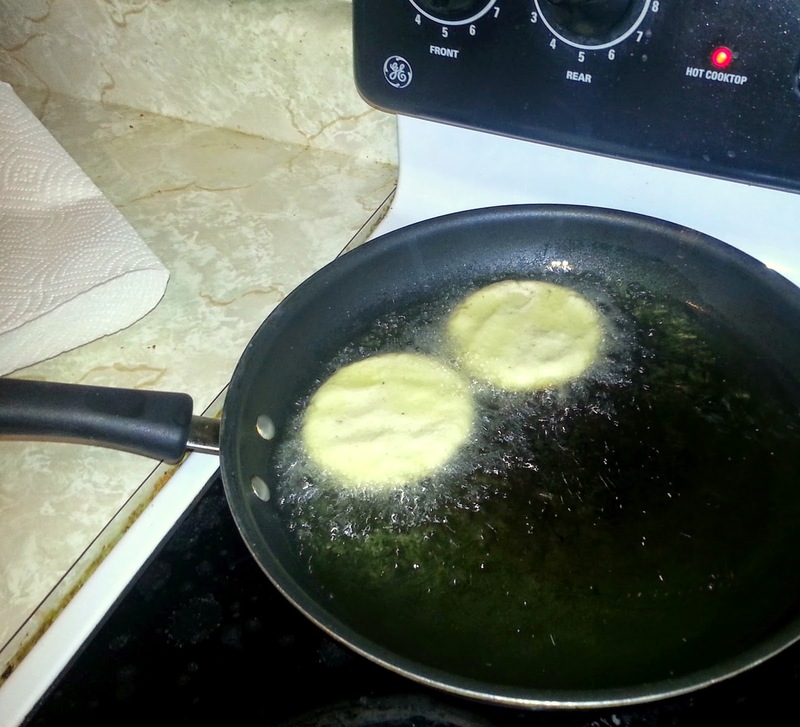 Fry the patties in about an inch of hot, but not smoking, vegetable or corn oil until golden and slightly puffed, turning once. Drain on paper towels. These flat enchiladas are light and airy inside with a crisp golden crust. They reminded me of little golden pillows. Cook any type of dried bean in boiling, salted water until soft. Blend with an emulsion blender. Add 1 can drained La Costena Pimento Morron Tiras (I could not find this brand of roasted red peppers so just used what I could find in my local market. You could also roast your own red peppers.) Blend again to incorporate peppers. Heat 1 Tbsp. oil and 1 Tbsp. butter in a saucepan or deep frying pan. Add 2-3 Tbsp. chili powder to the hot oil then add beans and fry, stirring frequently for about 15 minutes. This next ingredient really surprised me...add 1 can evaporated milk. 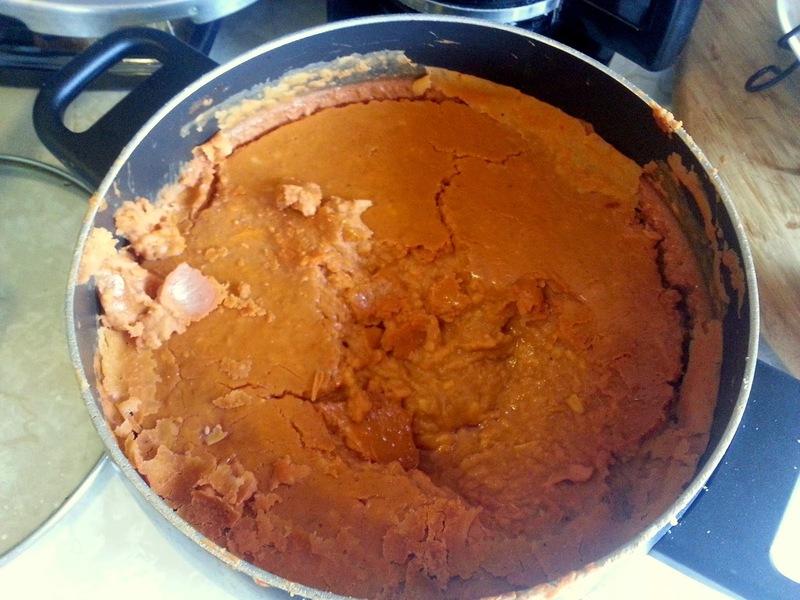 This is the ingredient that gives the beans a rich creaminess without using lard. Finally add about a cup of Mexican 4-cheese blend. Taste and season as needed. Set aside. Bonnie is contemplating the toppings she will use once she dips her flat enchilada in chili sauce. Dip your enchilada in the hot chili sauce to completely coat each side. Spoon extra sauce onto your plate. Top with re-fried beans, queso fresca, shredded lettuce, onion, green olives, avocado, Mexican crema. 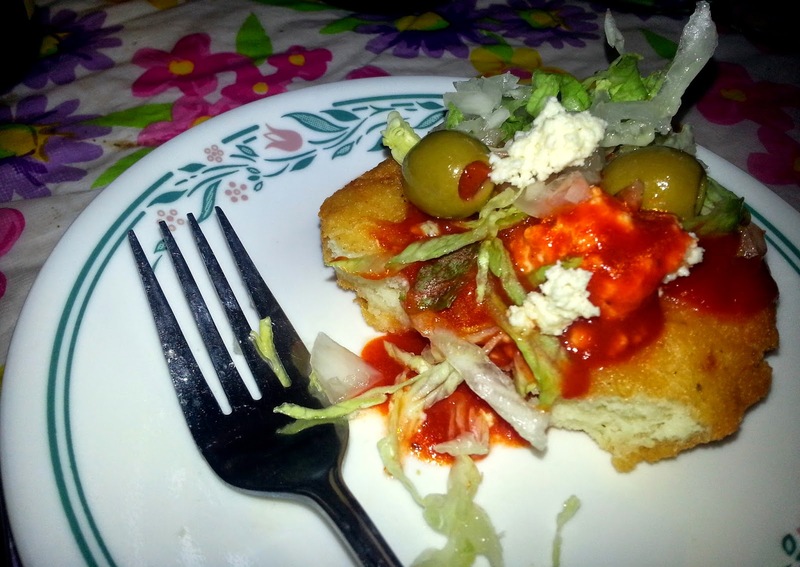 This dish does not taste anything like enchiladas as you may know them. 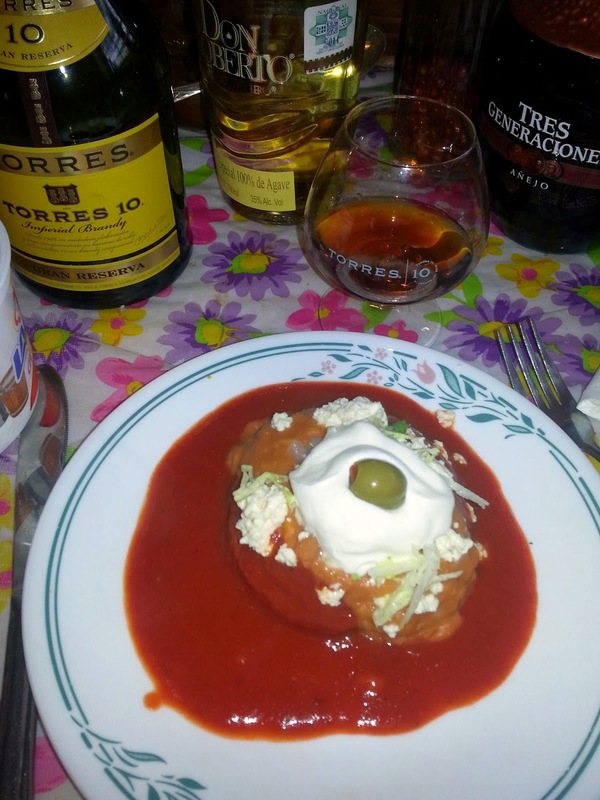 I am very fond of traditional enchiladas, but these were exquisitely delicious. 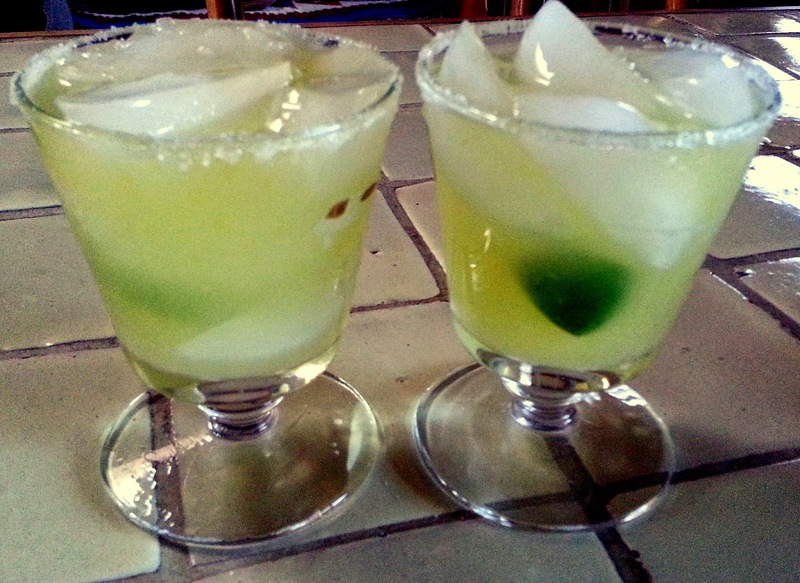 Since Marina and Lupita's demonstration, I have made them on my own. 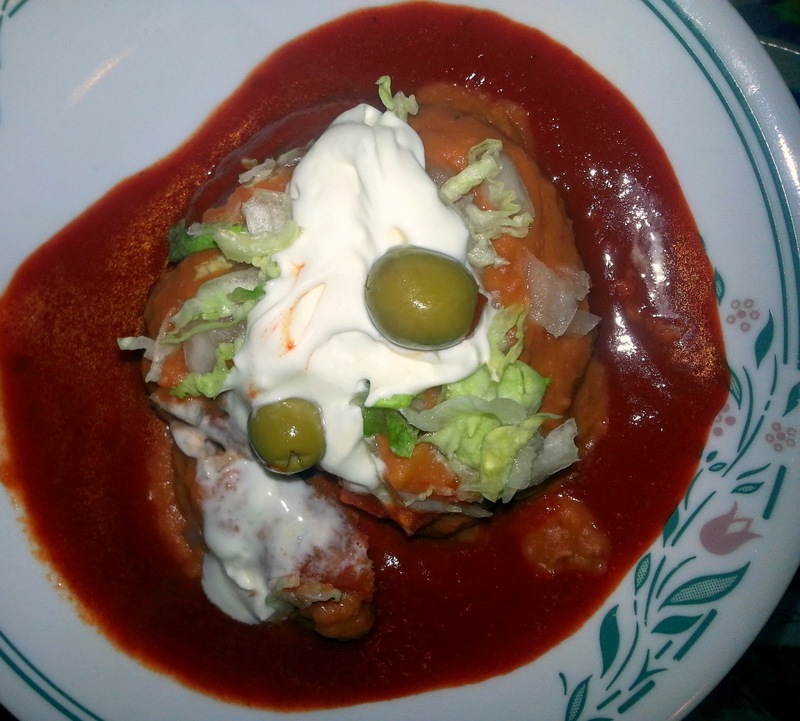 My flat enchiladas did not have quite as lovely a texture as Lupita's did, but they were pretty darn good. I will make them again and try to perfect my technique! You can make the sauce and beans ahead of time which helps make putting this dish together a little easier. Put all ingredients in a shaker. Shake vigorously. Pour into glasses rimmed with salt. What a fun day we had learning, eating, laughing and enjoying the company of two very gracious hosts. Best of all...we're going to do it again! Next time, Mole! Thanks for sharing another cooking experience with me. 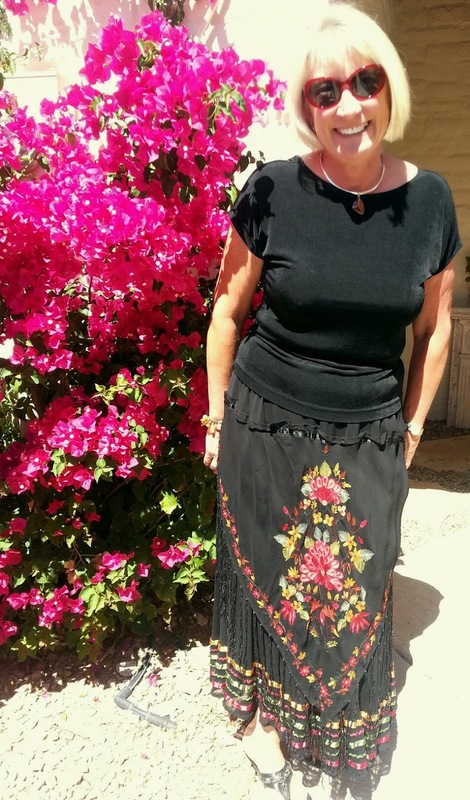 I love experiencing the food, culture, and customs of Mexico! This dish originated in the northern Italian city of Bologna. Traditionally it is a rich meat sauce with a small amount of tomatoes and tomato paste, served over spaghetti. In Italy it is called, Ragu alla Bolognese. Here, we tend to make Bolognese as a thick meaty tomato sauce. So if you are a purest the following recipe may go against the grain, but this is how my Mom used to make it. 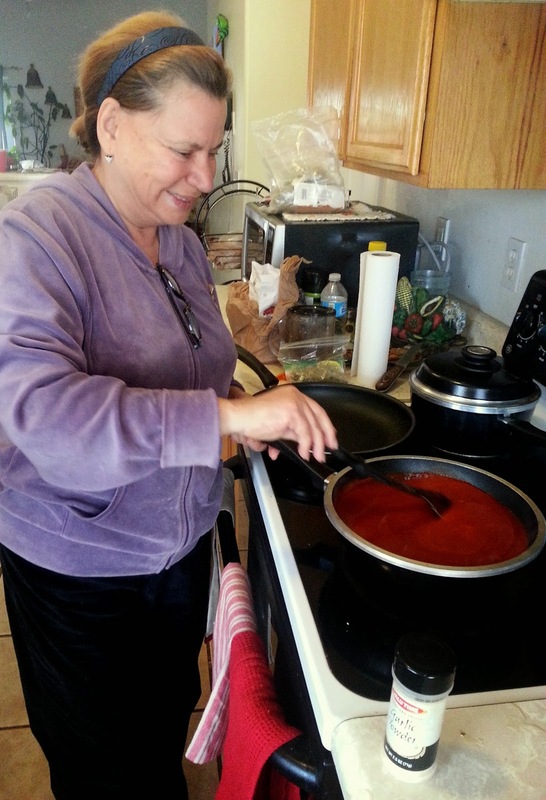 She generally made Spaghetti Bolognese in the winter, slow cooking it on her wood stove. The whole house smelled like a tratorria! 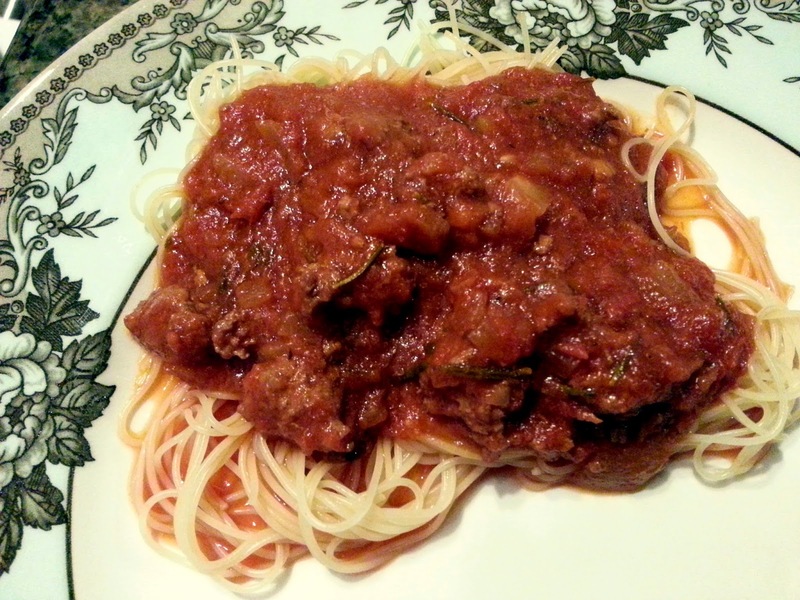 This dish is often served on spaghetti (hence the name! 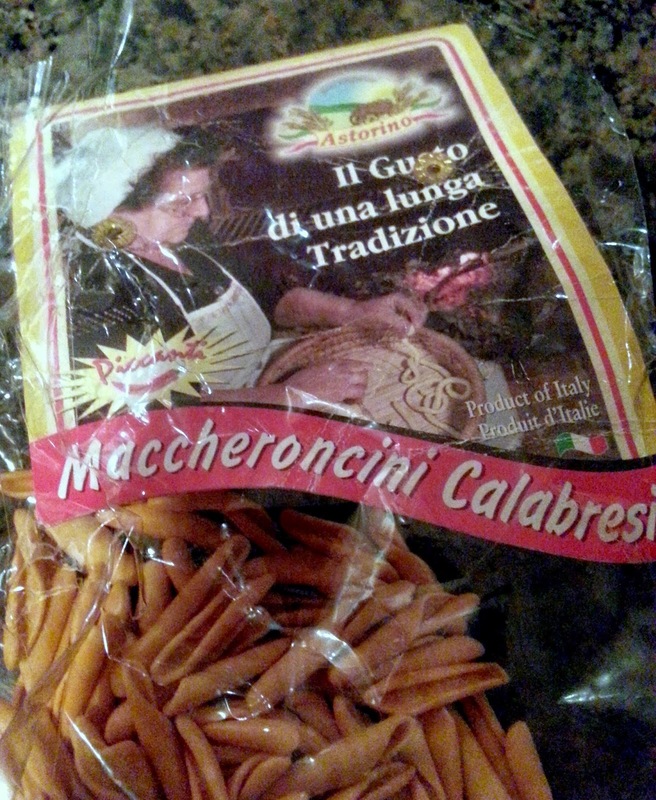 ), but you can serve it on any pasta. In fact, when I made Spaghetti Bolognese with my friend Leslie, we tried it both on spaghetti and on a wonderful pasta she had from Italy. 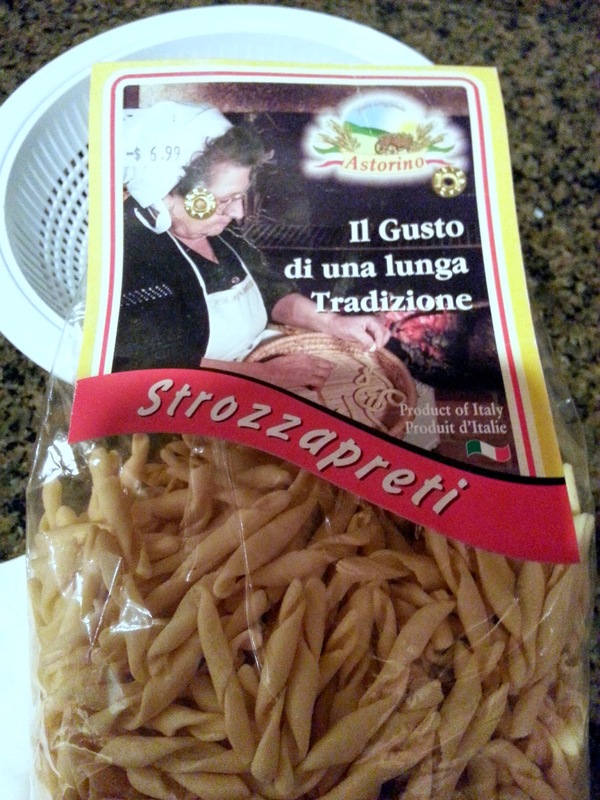 Leslie had 2 types in her pantry, the one shown above, which had a little hint of red pepper and a plain pasta version. We tried the Bolognese on the spicy pasta and it was wonderful! Heat a large skillet over medium heat. Add a splash of Olive Oil, a little salt/pepper, and saute the onion and garlic until soft, but not browned. Turn the heat up to medium-high and add the ground beef. (Make sure your meat is at room temp before adding to the hot pan.) Stir the beef to separate the meat and thoroughly incorporate the onion and garlic. Cook until beef is browned; about 10 minutes. Don't be concerned if it is not cooked through as this sauce will simmer for hours. Add fresh rosemary; oregano; bay leaf, hot pepper, 1 tsp. salt and 1/2 tsp. black pepper. Add 2 cups of wine and reduce by half; simmering about 15 minutes. Add 4 Tbsp. 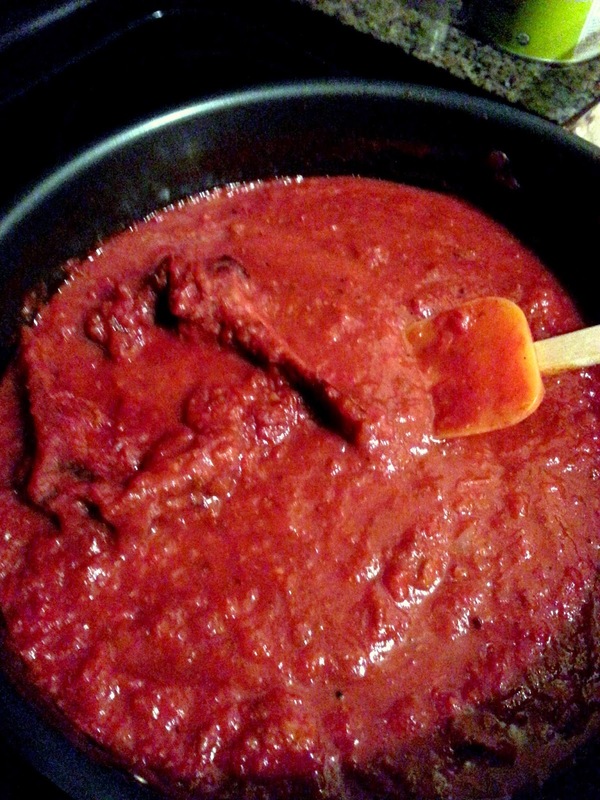 tomato paste; mix well with the meat. Add 2 cans chopped tomato, with their juice, and mix well again. Add 1 more cup wine. Cover allowing the sauce to release steam. Simmer for 3-4 hours. Stir sauce every 20 minutes or so. Check for seasoning and if sauce gets too thick you can add a little more wine, beef or chicken broth, or water. Remove bay leaf and beef bones if you were using them. Cook your spaghetti or whatever pasta you're using al dente and serve topped with Parmesan Cheese and a fresh sprig of basil. 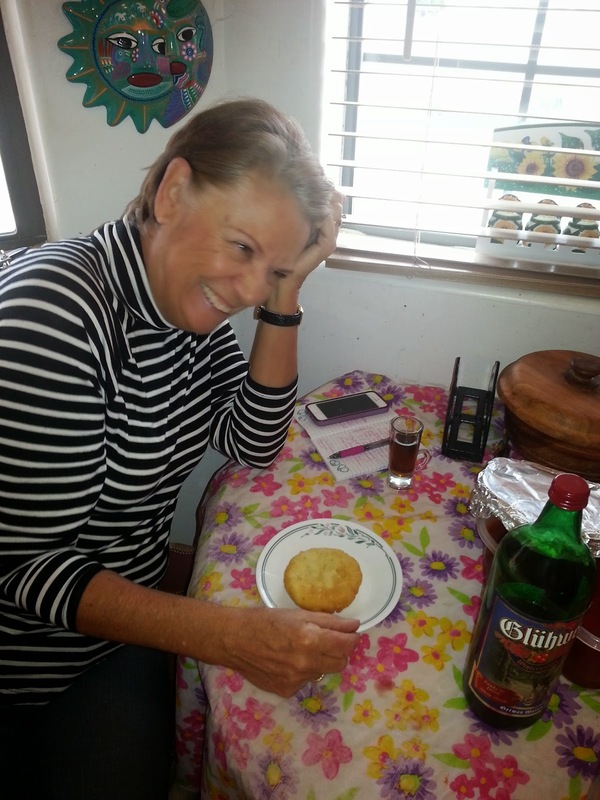 While our sauce was simmering Leslie treated me to a delicious glass of wine. I am not a wine expert, although I do drink my fair share. Fortunately for me, Leslie is. 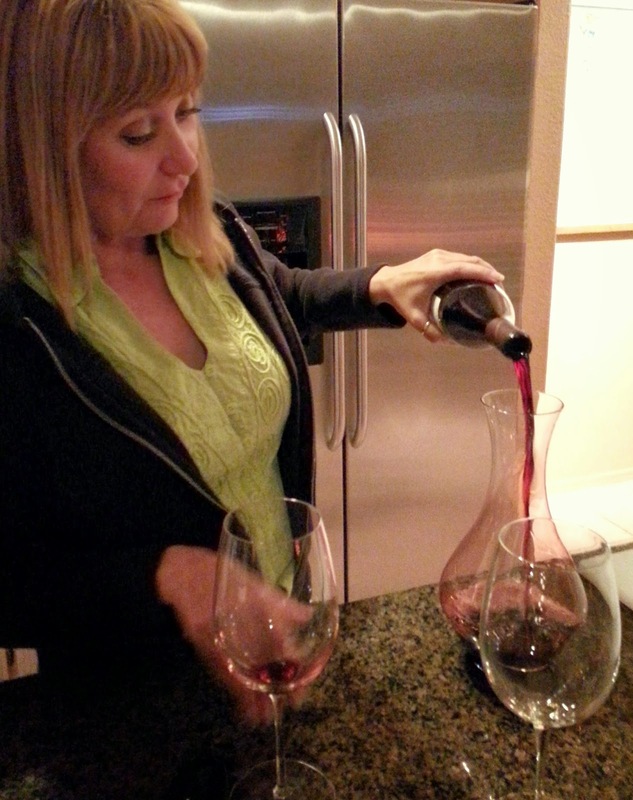 She chose to decant this wine to help accelerate the 'breathing' process and soften the taste of the tannins. She was able, just by smelling the wine after opening to make that decision. "Perfumed, lush, and complex to start, then vibrant in the mouth, with excellent integration of flavors, acidity, and tannins. 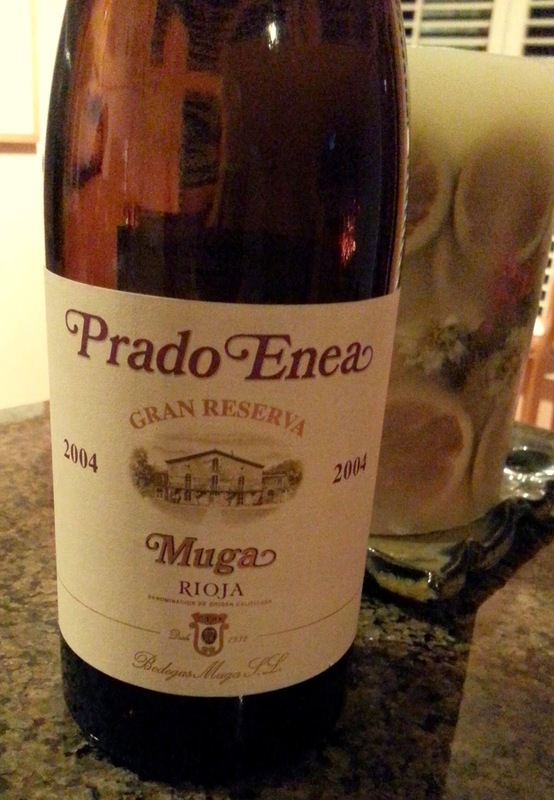 Tastes of fine tobacco, mulled blackberry, chocolate, and spices." That's just about how we described it, too! 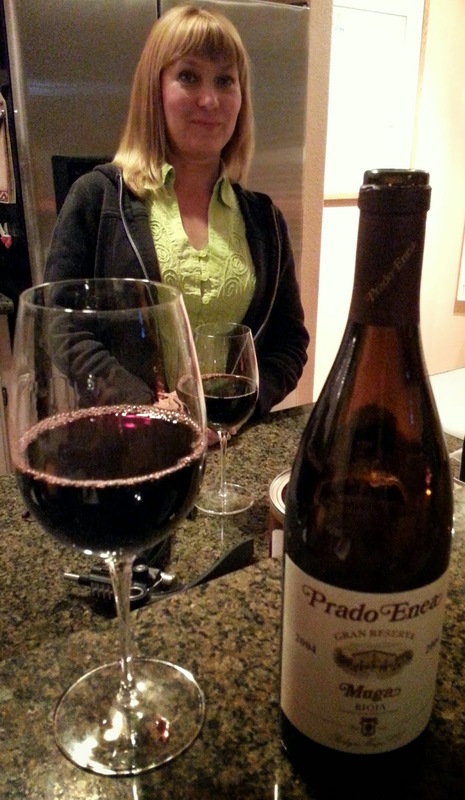 It was perfect to sip a glass of wine before the meal and also a fantastic companion to the Spaghetti Bolognese! Thank you Leslie! UNTIL NEXT TIME, KEEP COOKING AND REMEMBER THERE ARE NO MISTAKES IN THE KITCHEN.